For other uses, see Plum (disambiguation). Mature plum fruit may have a dusty-white waxy coating that gives them a glaucous appearance. This is an epicuticular wax coating and is known as "wax bloom". Dried plum fruits are called "dried plums" or prunes, although, in many countries, prunes are a distinct type of dried plum having a wrinkled appearance. Plums may have been one of the first fruits domesticated by humans. Three of the most abundant cultivars are not found in the wild, only around human settlements: Prunus domestica has been traced to East European and Caucasian mountains, while Prunus salicina and Prunus simonii originated in Asia. Plum remains have been found in Neolithic age archaeological sites along with olives, grapes and figs. The name plum derived from Old English plume or "plum, plum tree," which extended from Germanic language or Middle Dutch, and Latin prūnum, from Ancient Greek προῦμνον (proumnon), believed to be a loanword from Asia Minor. In the late 18th century, the word, plum, was used to indicate "something desirable", probably in reference to tasty fruit pieces in desserts. Plums are a diverse group of species. The commercially important plum trees are medium-sized, usually pruned to 5–6 metres height. The tree is of medium hardiness. Without pruning, the trees can reach 12 metres in height and spread across 10 metres. 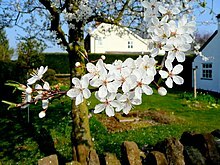 They blossom in different months in different parts of the world; for example, in about January in Taiwan and early April in the United Kingdom. Fruits are usually of medium size, between 2 and 7 centimetres in diameter, globose to oval. The flesh is firm and juicy. The fruit's peel is smooth, with a natural waxy surface that adheres to the flesh. The plum is a drupe, meaning its fleshy fruit surrounds a single hard seed. When it flowers in the early spring, a plum tree will be covered in blossoms, and in a good year approximately 50% of the flowers will be pollinated and become plums. Flowering starts after 80 growing degree days. If the weather is too dry, the plums will not develop past a certain stage, but will fall from the tree while still tiny, green buds, and if it is unseasonably wet or if the plums are not harvested as soon as they are ripe, the fruit may develop a fungal condition called brown rot. Brown rot is not toxic, and some affected areas can be cut out of the fruit, but unless the rot is caught immediately, the fruit will no longer be edible. Plum is used as a food plant by the larvae of some Lepidoptera, including November moth, willow beauty and short-cloaked moth. The taste of the plum fruit ranges from sweet to tart; the skin itself may be particularly tart. It is juicy and can be eaten fresh or used in jam-making or other recipes. Plum juice can be fermented into plum wine. In central England, a cider-like alcoholic beverage known as plum jerkum is made from plums. Dried, salted plums are used as a snack, sometimes known as saladito or salao. Various flavors of dried plum are available at Chinese grocers and specialty stores worldwide. They tend to be much drier than the standard prune. Cream, ginseng, spicy, and salty are among the common varieties. Licorice is generally used to intensify the flavor of these plums and is used to make salty plum drinks and toppings for shaved ice or baobing. Pickled plums are another type of preserve available in Asia and international specialty stores. The Japanese variety, called umeboshi, is often used for rice balls, called onigiri or omusubi. The ume, from which umeboshi are made, is more closely related, however, to the apricot than to the plum. 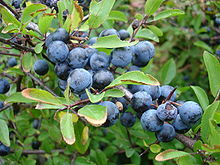 In the Balkans, plum is converted into an alcoholic drink named slivovitz (plum brandy) (Serbian: šljivovica). A large number of plums, of the Damson variety, are also grown in Hungary, where they are called szilva and are used to make lekvar (a plum paste jam), palinka (traditional fruit brandy), plum dumplings, and other foods. As with many other members of the rose family, plum kernels contain cyanogenic glycosides, including amygdalin. Prune kernel oil is made from the fleshy inner part of the pit of the plum. Though not available commercially, the wood of plum trees is used by hobbyists and other private woodworkers for musical instruments, knife handles, inlays, and similar small projects. Plum has many species, and taxonomists differ on the count. Depending on the taxonomist, between 19 and 40 species of plum exist. From this diversity only two species, the hexaploid European plum (Prunus domestica) and the diploid Japanese plum (Prunus salicina and hybrids), are of worldwide commercial significance. The origin of these commercially important species is uncertain but may have involved P. cerasifera and possibly P. spinosa as ancestors. Other species of plum variously originated in Europe, Asia and America. P. havardii Havard's plum western Texas in the United States and to northern Chihuahua across the Río Grande in Mexico. P. maritima Beach plum East Coast of the United States, from Maine south to Maryland. P. sibirica Siberian apricot eastern China, Japan, Korea, Mongolia, and eastern Siberia. In certain parts of the world, some fruits are called plums and are quite different from fruits known as plums in Europe or the Americas. For example, marian plums are popular in Thailand, Malaysia and Indonesia, otherwise also known as gandaria, plum mango, ma-praang, ma-yong, ramania, kundang, rembunia or setar. Another example is the loquat, also known as Japanese plum and Japanese medlar, as well as nispero, bibassier and wollmispel elsewhere. In South Asia and Southeast Asia, jambul, a fruit from tropical tree in Myrtaceae family, is similarly sometimes referred to 'damson plums', and it is different from damson plums found in Europe and Americas. Jambul is also called as Java plum, Malabar plum, jaman, jamun, jamblang, jiwat, salam, duhat, koeli, jambuláo or koriang. In 2016, global production of plums and sloes was 12.1 million tonnes, led by China with 55% of the world total (table). Other major producers were Romania, Serbia, and the United States (table). Raw plums are 87% water, 11% carbohydrates, 1% protein, and less than 1% fat (table). In a 100 gram amount, raw plums supply 46 Calories and are a moderate source only of vitamin C (12% Daily Value), with no other nutrients in significant content (table). ^ a b "Prune". Oxford Dictionaries, Oxford University Press. 2018. Retrieved 1 March 2018. ^ Jules Janick, ed. (1998). Horticultural Reviews (Volume 23). Wiley. ISBN 978-0471254454. ^ Jules Janick (2005). "The origins of fruits, fruit growing and fruit breeding" (PDF). Purdue University. Archived (PDF) from the original on 2013-05-21. ^ Spangenberg; et al. (January 2006). "Chemical analyses of organic residues in archaeological pottery from Arbon Bleiche". Journal of Archaeological Science. 33 (1): 1–13. doi:10.1016/j.jas.2005.05.013. ^ a b "Plum". Etymology Online Dictionary; Douglas Harper. 2017. Archived from the original on 2 July 2017. Retrieved 12 June 2017. ^ "Plum, prune, European type". Purdue University. 1999. Archived from the original on 2012-04-12. ^ "Prunus domestica Plum, European plum PFAF Plant Database". pfaf.org. Archived from the original on 2012-11-22. ^ Crowell and Guymon (1973). "Aroma Constituents of Plum Brandy". American Journal of Enology. 24 (4): 159–165. ^ Jan Velíšek; František Pudil; Jiří Davídek; Vladislav Kubelka (1982). "The neutral volatile components of Czechoslovak plum brandy". Zeitschrift für Lebensmittel-Untersuchung und -Forschung A. 174 (6): 463–466. doi:10.1007/BF01042726. ^ Burrows, G.E. ; Tyrl, R.J. (2012). "Rosaceae Juss.". Toxic Plants of North America. Wiley-Blackwell. pp. 1064–1094. ^ "Plum". The Wood Database. Archived from the original on 2014-10-25. ^ a b "Plum (and sloe) production in 2016; Crops/Regions/World/Production Quantity by picklists". UN Food & Agriculture Organization, Statistics Division. 2018. Retrieved 1 March 2018. ^ Bruce L. Topp; Dougal M. Russell; Michael Neumüller; Marco A. Dalbó; Weisheng Liu (2012). Plum (Handbook of Plant Breeding). 8, part 3. pp. 571–621. doi:10.1007/978-1-4419-0763-9_15. ^ "Prunus simonii in Flora of China @ efloras.org". efloras.org. Archived from the original on 2013-11-03. ^ "Under-Utilized Tropical Fruits of Thailand (see Part 1, section 3)". FAO, United Nations. 2001. Archived from the original on 2011-07-15. ^ "Japanese Plum - Loquat". University of Florida, Nassau County Extension, Horticulture. 2006. Archived from the original on 23 July 2008. ^ J. Morton (1987). "Loquat". University of Purdue. Archived from the original on 2013-06-24. ^ "Jambolan". Purdue University. 2006. Archived from the original on 2012-09-10. Wikimedia Commons has media related to Plums. Look up plum in Wiktionary, the free dictionary.